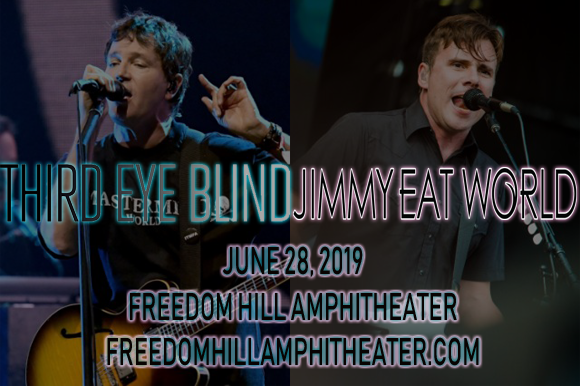 Third Eye Blind have delighted indie-rock fans everywhere with their choice of special guest for this year's Summer Gods Tour, bringing the incredible Jimmy Eat World (who celebrate their 25th anniversary this year) along for the ride! The tour comes to Freedom Hill Amphitheatre on Friday 28th June 2019 and sees the two headliners supported by Syracuse baroque pop band Ra Ra Riot! Touring in the summer "feels like more of a festival thing, because Third Eye Blind takes a lot of time in picking out the bands to play with us," said Third Eye Blind frontman Stephen Jenkins in an interview with iHeartRadio. American rock band Jimmy Eat World burst onto the scene in 2001 with the release of their fourth studio-album, Bleed American. The album launched four top twenty singles: "Bleed American", "The Middle", "Sweetness", and "A Praise Chorus", and "The Middle" became the band's highest-charting single to date, reaching number-one on the Billboard Modern Rock Tracks chart and number five on the Billboard Hot 100. Their success continued throughout the 2000s and their 2007 album Chase This Light is their most successful to date, peaking at number 5 on the Billboard 200. The band was formed in Meza, Arizona in 1993 and currently consists of lead guitarist/lead vocalist Jim Adkins, drummer Zach Lind, rhythm guitarist/vocalist Tom Linton, and bassist Rick Burch. To date, they have released nine studio albums in total, their most recent being Integrity Blues (2016).